Produced by long-time collaborator Bob Ezrin (Pink Floyd, Deep Purple), and featuring guests like ZZ Top guitarist Billy Gibbons, U2 drummer Larry Mullen Jr., Deep Purple bassist Roger Glover, as well as a highly anticipated mini-reunion of the original Alice Cooper band members [Dennis Dunaway, Neal Smith, and Michael Bruce], Paranormal is full of surprises and riveting turns. In keeping with his passion for the unexpected, the singer decided to steer clear of writing another concept album like 2011’s Welcome 2 My Nightmare, and focused on creating an explosive collection of unforgettable standalone songs. Out of the 20 tunes, they picked a dozen to immortalize, each played for thrills, chills and even a few laughs. “Dynamite Road” tells the story of a band that has a deadly encounter with the devil. In “Fireball,” the singer has a bad dream about the end of the world, only to wake up in time to see it happening in real life. “Genuine American Girl” is about a tough guy who is transgender and not afraid to let the world know about it, and the title track is the tender story about a girl and her best ghoul friend. Banana peels aside, perhaps the biggest surprise on Paranormal is the historic two-song mini-reunion with his former bandmates, guitarist Michael Bruce, bassist Dennis Dunaway, and drummer Neal Smith. One could argue that the two songs, “Genuine American Girl” and the Who-inspired “You and All Your Friends,” do more than fit in. They stand out, as in their iconic sound being instantly recognizable. Like any great entertainer, Alice Cooper is compelled to over deliver. 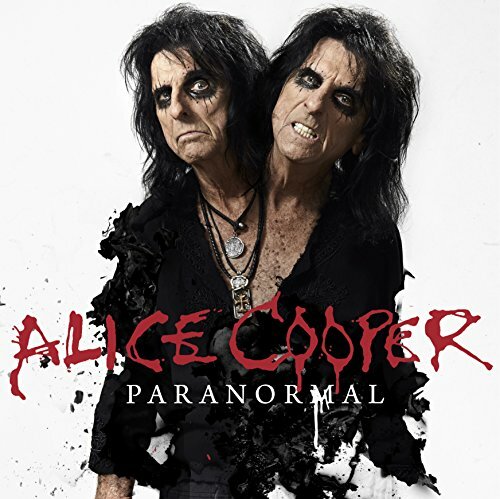 In addition to the 12 new tracks on Paranormal, the singer has included a bonus disc of his current band playing killer live versions of some of The Coop’s greatest hits, such as “No More Mr. Nice Guy,” “Billion Dollar Babies,” and “School’s Out.” Think of it as a taste of what to expect at an Alice Cooper concert circa 2017, including a summer co-headline North American tour with the equally legendary Deep Purple. On his radio show “Nights With Alice Cooper” Alice debuted the first single, “Paranoiac announced, Paranormal features two songs written and recorded with the original members of the Alice Cooper band and also has guest appearances by ZZ Top guitarist Billy Gibbons, U2 drummer Larry Mullen and Roger Glover of Deep Purple. The album is out July 28th on earMUSIC and can be pre-ordered via Amazon and iTunes today. There will also be a limited run of blood-red vinyl available at indie retailers across the country.